Don’t forget to specify the environment! See Configuration for available options. They can also be specified in a configuration file. /receiver which is the receiver part that a display should load. To test that everything is setup correctly, point your browser to /unassigned (for example http://localhost:9400/unassigned if you kept the default parameters and installed Dashkiosk on your PC). You should see the default dashboard displayed for unknown device. These are just a few photos cycling around. Then, you should go to the administration interface located in /admin. While in the administration interface, open another tab and go to /receiver which is the URL displaying the receiver. In the /admin tab, you should see yourself as a new display in the “Unassigned” group and in the /receiver tab, you should see the default dashboard that you got by going in /unassigned. To customize the default dashboard, see Unassigned dashboard. If something goes wrong, be sure to look at the log. Either you run the server through something like supervisord and you can have a look at the log in some file or you can use --log.file to get a log file. The administration interface with a few groups. At the top, the special “Unassigned” group. The monitors with a 5-digit serial numbers are the displays. For each of them, the serial number is attributed on their first connection and stored locally in the display . They come with a green light when they are actually alive. Each display is affected to a group of displays. In the above figure, we have three groups. It is possible to move a display from one group to another. Each group can have a name and a description. It is possible to create or rename any group. The group named “Unassigned” is special and new displays will be attached to it on first connection. Other than that, this is a regular group. The other special group is “Chromecast devices”. See Chromecast devices. Each group of displays contains an ordered list of dashboards. A dashboard is just an URL to be displayed with a bunch of parameters. 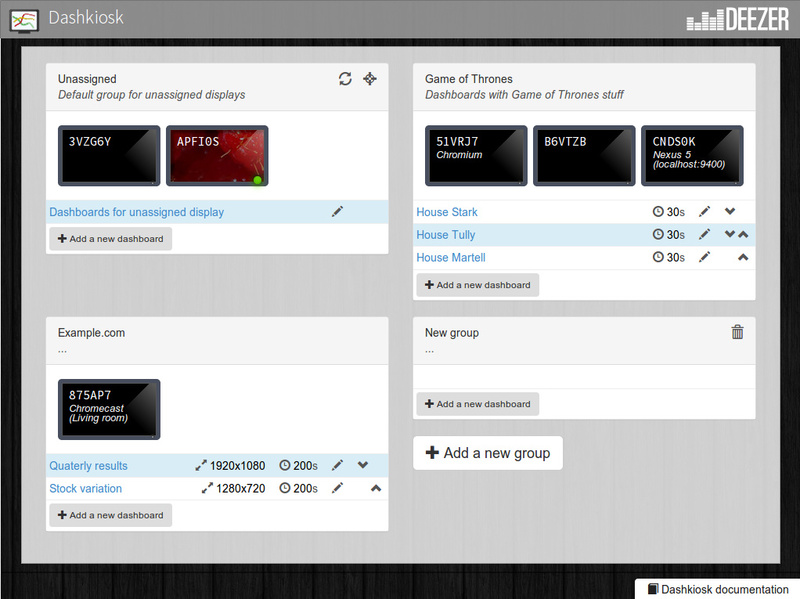 You can reorder the dashboards in a group and choose how much time they should be displayed. The first time, you will only have the special “Unassigned” group . Clicking on a display will show a dialog box with various information about the display. The dialog box of the APFI0S display. First, you get the IP address of the display. This could be useful if you need to connect to it for some other purpose (like debugging a problem related to this display). If the display is offline, the IP displayed is the last known IP. toggle the OSD on the receiver. The receiver OSD is a neat feature to check if the display you are inspecting is really the one you are interested in. It will display an overlay with the display name as well as some technical information that may be useful when displaying dashboards. Not shown on the above figure, you can destroy a display by clicking on the Delete button in the lower left corner. You can assign a description to the display, like “In the kitchen”. You can also change the group the display is currently attached to by choosing another group in the dropdown menu. The display should immediatly display the current dashboard of the group. The viewport will be explained in a dedicated section. See Viewport. On a desktop browser, it is also possible to move the display to another group by dragging it to the appropriate group. By default, you only get the “Unassigned” group. 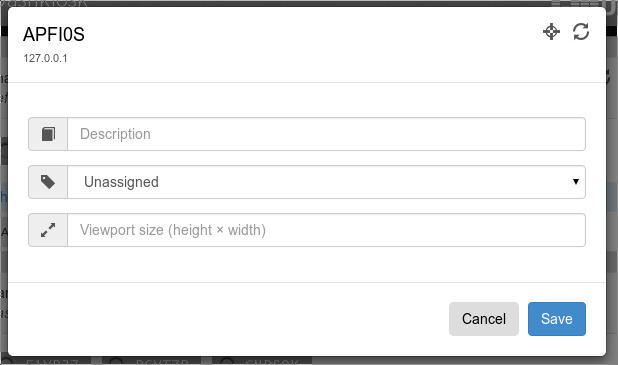 But you can create any number of groups you need by clicking on the “Add a new group” button. The name and the description of a group can be changed by clicking on them. If you change the name of the “Unassigned” group, a new “Unassigned” group will be created the next time a new display comes to live. The group can only be destroyed if no display is attached to it. Each group has a list of dashboards. You can reorder them by using the up and down arrow icons on the right of each dashboard. You can add a new dashboard by using the “Add a new dashboard” button. You can also move or copy a dashboard from another group by using drag’n’drop. By default, a move operation is issued. However, by using a modifier, you will copy the dashboard. Copying a dashboard from one group to the same group will result in a duplicate. The dialog box to modify some random dashboard. a viewport size (see Viewport). The first timer (timeout) is optional but it doesn’t make sense to omit it if you have several dashboards in a group. Without it, once the dashboard is displayed, the next one will never be displayed unless you remove or modify the current one. The time spent loading the dashboard and the additional specified delay are reducing the amount of time a dashboard is displayed. 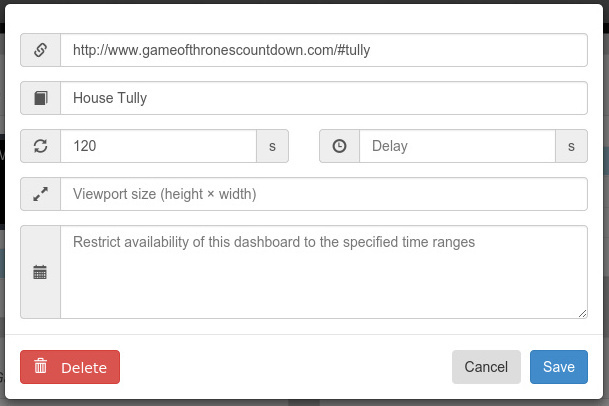 If a dashboard takes 5 seconds to load and an additional delay of 5 seconds is requested, if it is specified to be displayed for 30 seconds, it will in fact be displayed only during 20 seconds. You can also modify the timer and the viewport by clicking on them directly in the list of dashboards in each group. except on saturday and sunday will not display the dashboard on Saturday nor on Sunday. after 9:00 am and before 6:00 pm except on saturday and sunday will only display the dashboard during work hours. after 9:00 am and before 6:00 pm on monday through friday achieves the exact same effect. If one rule matches, the dashboard will be displayed. You need to ensure that there is at least one dashboard in each group that can be displayed at anytime. For the complete grammar, have a look at the documentation of Later.js. Each rule is prefixed by every 1 second. The availability of a dashboard is only assessed when moving from one dashboard to another. If a dashboard becomes unavailable while the timeout is not elapsed, no change will happen. For Android displays, see Android application. For Chromecast devices, see Chromecast devices. For all other displays, you need to point a web browser to the receiver URL (the one ending with /receiver). If you want additional animations, you can use /receiver-fast instead. However, if your device is quite slow (for example, a Raspberry Pi without hardware acceleration), you can disable most animations by using /receiver-slow. The dashboards to be displayed can be any URL accessible by the displays. When a new dashboard has to be displayed for a group, the server will broadcast the URL of the dashboard to each member of the group. They will load the dashboard and display it. This may seem easy but there are several limitations to the system. So, the first important thing about those dashboards is that they are fetched by the displays, not by the server. You must therefore ensure that the dashboards are accessible by the displays and not protected by a password or something like that. Some dashboards may be pretty dynamic and use special effects that look cool on the average PC. However, when using a US$ 30 low-end Android stick to display it, it may become a bit laggy. Also, please note that the Android application uses a modern webview but some functionalities may be missing, like WebGL. By default, a dashboard is displayed using the native resolution of the display. If the display is a 720p screen and your dashboard can only be rendered correctly on a 1080p screen, you have a problem. There are several solutions to this problem. Use a responsive dashboard that can adapt itself to any resolution. Change the viewport of the display. By clicking on the display, you can specify a viewport. When empty, it means that you use the viewport matching the native resolution of the screen. By specifying another resolution, the display will render the dashboards at the given resolution and zoom in or out to fit it into its native resolution. The support of this option depends on the ability of the browser running the receiver to exploit this information. Android devices are able to make use of it but other devices may not. If you don’t see any effect when changing the viewport, use the next option. Change the viewport of the dashboard. This is quite similar to the previous option but it is a per-dashboard option and it will work on any device. It works in the same way: the rendering will be done at the given resolution and then resized to fit in the screen. Both options can be used at the same time, there is no conflict. The receiver has almost no way to communicate with the IFrame . It can know when an IFrame is ready but not if there is an error. The IFrame can therefore be displayed while it is not fully rendered and on the other hand, we cannot detect any error and try to reload the IFrame. The IFrame can refuse to be display its content if there is a special X-Frame-Options in the headers forbidding the use of an IFrame. If you are serving Dashkiosk from an HTTPS URL, you cannot display dashboards using HTTP. The other way is authorized. Hence, it seems just easier to serve Dashkiosk receiver on HTTP. Find an embeddable version of the content. Youtube, Google Maps and many other sites propose a version specifically designed to be embedded into an iframe. Use a web proxy that will strip out the offending header. A good base for such a proxy is Node Unblocker. It should be easy to modify it to remove the X-Frame-Options header. If you use nginx to reverse proxy a service, you can use proxy_hide_header X-Frame-Options. If the application is using Ruby on Rails, add set :protection, :except => :frame_options in config.ru. Use a screenshot service. Instead of displaying the real website, just display a screenshot. There are many solutions to implement such a service with headless browsers like Phantom.JS. For example this one. If the iframe is in the same domain, it can communicate with the iframe. However, most of the time, this is not the case. The receiver can also communicate with a cooperating iframe by sending messages. This is currently not implemented. The serial number is stored either in the local storage of the browser or in a cookie. If a display comes without this serial number or with an invalid one, it will be granted a new one. The appropriate token is also put in the URL in case neither cookies or local storage are available. This way, you can point the browser to the receiver part, then bookmark or turn the web page as an application. If you don’t have this group, this may be because no display has ever been registered. In this case, point your browser to the /receiver URL to register one.